You are here: Home / Foot Care Blog / Toenail Fungus / Types of Onychomycosis: Which Do You Have? Types of Onychomycosis: Which Do You Have? February 11, 2014 /0 Comments/in Toenail Fungus /by Jenn F.
When we talk about onychomycosis — more commonly known as “toenail fungus” — we usually speak very generally about the condition. However, in addition to there being different degrees of severity, there are actually several different types of nail fungus as well. We’ll cover them in today’s post and talk a little about the prevention of problematic recurring toenail fungus as well. There are several different types of toenail fungus. Distal subungual is the most common type of toenail fungus, accounting for about 75 to 85% of all cases, according to toenail fungus experts Richard K. Scher MD, Warren Joseph DPM, and Jeffrey Robbins DPM. The infection begins when the T. rubrum dermatophyte attacks the skin of the distal nail bed. Many times people with athlete’s foot will also develop this type of toenail fungus. Often, patients do not detect the earliest stages of infection, but notice something is wrong when the layers begin to thicken and develop the tell-tale striation lines of hyperkeratosis. As the nail bed becomes more disturbed, a yellow-brown discoloration sets in. 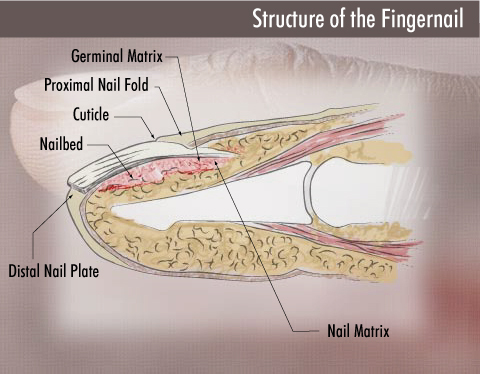 The structure of the fingernail and toenail are the same. Less commonly, people may develop proximal subungual onychomycosis, which starts at the nail matrix, bed, and plate. Over time, it seeps deeper into the nail. Different types of pathogens can cause proximal subungual toenail fungus, including: T megninii, T mentagrophytes, T rubrum, T schoenleinii, T tonsurans, and Epidermophyton floccosum. HIV patients develop this type of onychomycosis more commonly than the general population. Usually the nail appears white along the bottom portion of the nail, with most of the nail plate remaining smooth. White superficial onychomycosis (about 10% of all cases) is another type of toenail fungus that attacks immuno-suppressed patients more than the general population. Pathogens like Acremonium sp., T mentagrophytes and T rubrum are common culprits to this type of nail fungus that is exclusive to the toes. The infection begins on the surface of the nail plate and will eventually spread across the entire bed, causing tell-tale crumbling. Endonyx onychomycosis is often caused by Trichophyton soudanense and does not cause the usual thickening or nail bed inflammation. Present in the lower layers of the nail plate, the milky-white discoloration is the most defining characteristic of the infected nail. About 5-7% of toenail fungus cases can be attributed to a yeast infection of the nail. Patients with chronic mucocutaneous candidiasis or immunosuppression are more likely to suffer from a candida albicans attack. The toenails can be infected, but the condition is more commonly seen in fingernails. The digits often become inflamed “drumsticks” and the nails may turn yellow, white, green or black, depending on the progression. You may not see these T. rubrum spores in your shoes, but if you have toenail fungus, be assured they are there! No matter which type of toenail fungus you’ve come down with, it’s important to keep in mind that there is a tendency to suffer a recurrence once a fungal attack has occurred. Recurrence rates may vary from as little as 6.5% to as great as 53%, despite aggressive treatment with oral antifungal drugs. In addition to treating the nail itself, be sure to rid your environment of all reproductive fungal spores. This includes the sanitization of all footwear, socks, sheets, and towels.